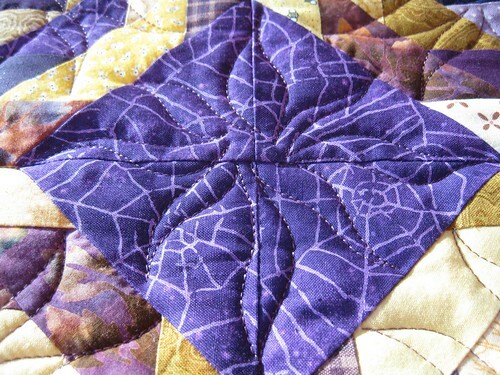 I finished the machine quilting and binding for the Purple Pineapple quilt about a week ago. 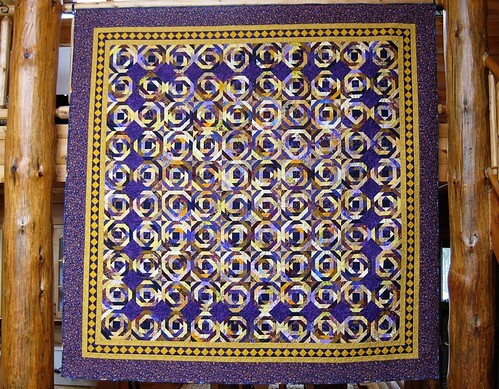 After quilting and binding, the quilt measured 99 inches by 99 inches. 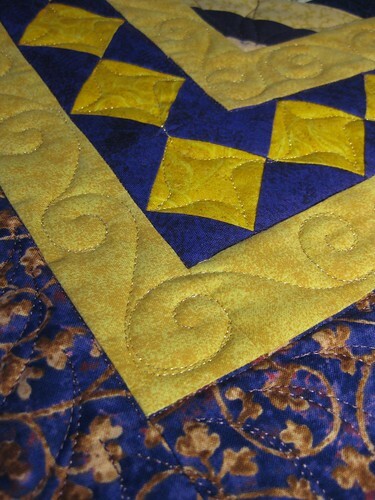 First, I did a little practice piece of the quilting designs I intended to use. I determined how to quilt across the entire row of pineapple blocks without any additional stops and starts. By quilting just the top half of the “star” design quilting from left to right, and then the bottom half of the “star” quilting right to left, I was able to achieve this, making the whole process much faster and more enjoyable. 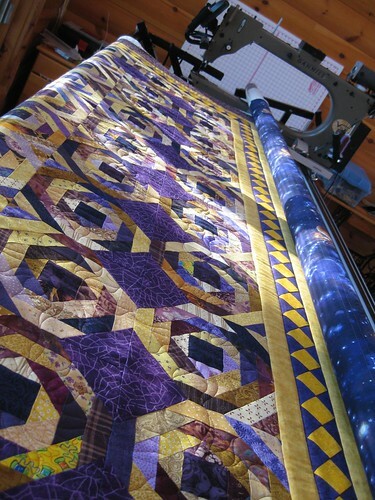 Here is a view of the quilt loaded on my relatively new Gammill Vison 26-10 on a nice sunny day. 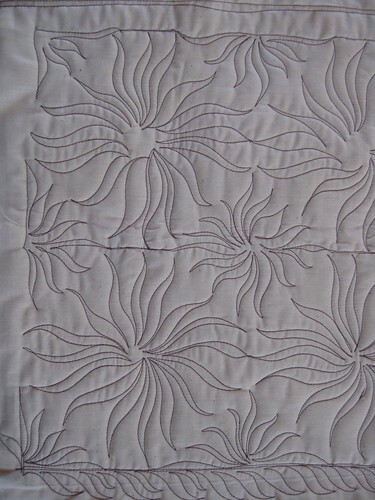 Close up of star design in the pineapple block………. ……..and in the corner block. Close up of the border………. …….and the border going around a corner. 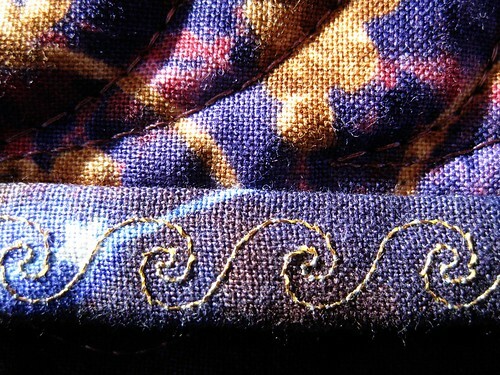 Close up of inside border quilting. I used Superior brand gold metallic thread on the inside borders. 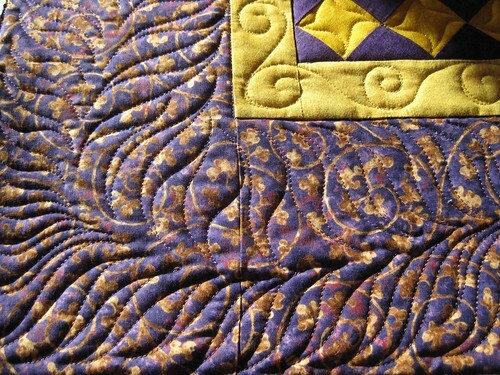 I used Fil-Tec Glide thread on all the other quilting. 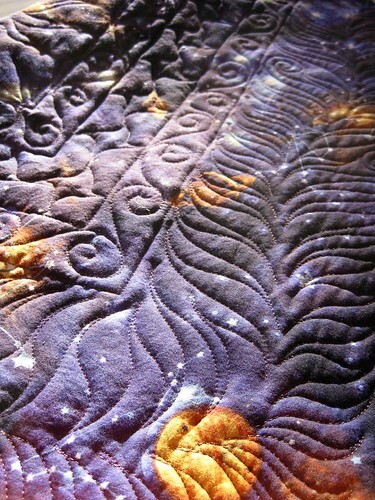 Some views of the quilting from the back side of the quilt. I had some fun with the binding on this quilt, too. 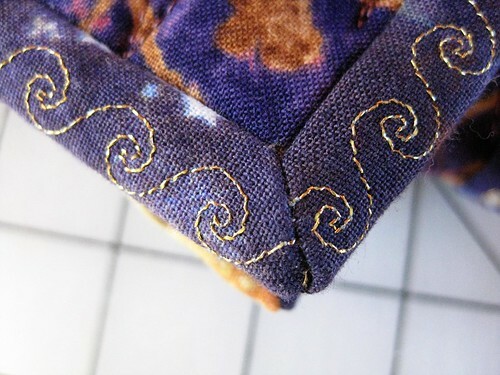 Since I was having such good luck with the metallic thread quilting the inner borders, I decided to embellish the binding with machine embroidery using the metallic thread as well. There are no seams along the entire length of the binding on each side. The seams are actually mitered at the corners. Great idea on quilting the blocks! I have seen hundreds of quilt and nearly so many can be found on my blog, but Your pattern (first photo), That I have not seen ever. Absolutely wonderful pictures. But they don’t even come close to showing the workmanship, talent and beauty that comes through seeing it up close and personal. You are such an inspiration to me, THANK YOU. Beautiful touches everywhere you look! You are so talented! This a a big quilt, so I assume for a bed? At 99 x 99 inches it is certainly big enough for a bed. however, I would expect at least 3 inches of shrinkage the first time it is washed. I was just excited and entertained by Gyleen Fitzgerald’s tool and book for making pineapple blocks, so I went through all my scraps and cut all the purples and golds and yellows into strips. After making a few blocks I got the idea for the inner border by making some of the corners out of the same reads-like-a-solid fabric. I really have no plans for the quilt right now, but it was a lot of fun to make. 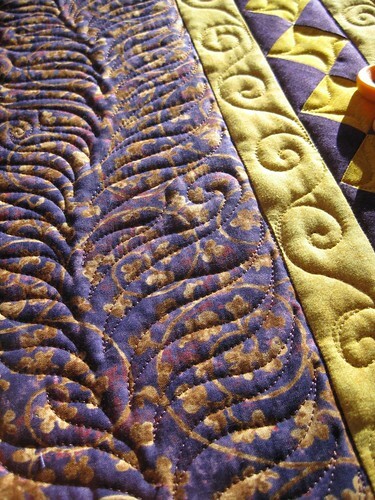 How did you quilt the binding? On your small machine? If on the longarm, how did you load it. 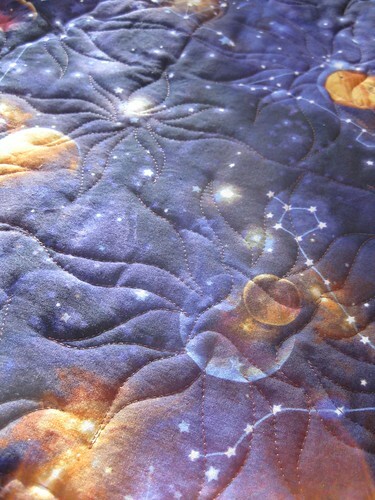 This quilt is just beautiful!!! Stunning indeed! You are MY new Pineapple Queen for sure! Beautiful colors, too. 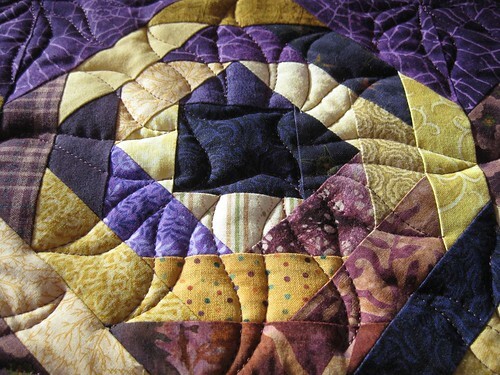 Your quilt rocks and the quilting design is perfect!